After installing an Acctivate update, a user will need to log into each Acctivate company file and upgrade the database. In certain cases, a user may receive the error, below, when upgrading the company database. Acctivate can be configured to connect to SQL Server using one of two different authentication methods. You can use SQL authentication, which is the preferred and default method for authentication, and Windows authentication. Regardless of which method Acctivate is configured to connect to SQL Server as, the user does not have sufficient permissions to perform a database routine. You can review the authentication method and user information by opening Acctivate Database Maintenance, then from the toolbar, select Database -> Database Sources. 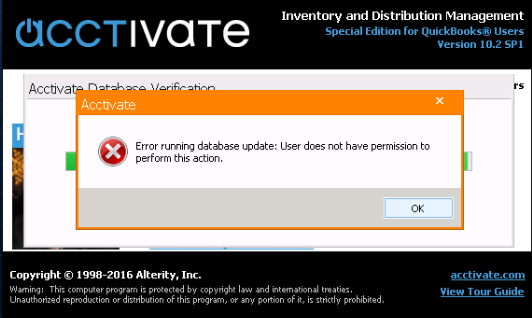 If Acctivate is configured to use a new sql user, you may need to review the permissions and modify them accordingly.